A provocative work that challenges the traditional and widely accepted principles of business management -- and proves that they are outdated, outmoded, or simply don't work Do open floor plans really work? Are there companies that put their employees' welfare first, and their clients second? Are annual performance reviews necessary? 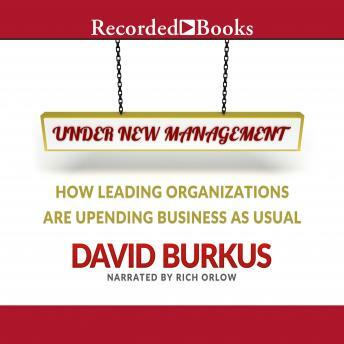 Dr. David Burkus is a highly regarded and increasingly influential business school professor who challenges many of the established principles of business management. Drawing on decades of research, Burkus has found that not only are many of our fundamental management practices wrong and misguided, but they can be downright counterproductive. These days, the best companies are breaking the old rules. At some companies, e-mail is now restricted to certain hours, so that employees can work without distraction. Netflix no longer has a standard vacation policy of two to three weeks, but instructs employees to take time off when they feel they need it. And at Valve Software, there are no managers; the employees govern themselves. The revolutionary insights Burkus reveals here will convince companies to leave behind decades-old management practices and implement new ways to enhance productivity and morale.